You know what's more lame than having your husband say you can't buy any more home decor? Having to spend some of your budget on... blinds. Ugh. I'm quickly learning that buying furniture and new decor adds up quick. Since our new house is going to be about 50 percent empty even after we are finished unpacking all of our crap, I've been on the hunt for some new affordable decor. We're kind of starting from scratch in the living room, dining room, and lighting department so I really want to keep things classic. Read: things I won't get sick of quickly or will go out of style. Living Room. The living room furniture is one thing that we spent a little more money on than we wanted but we know we're getting an insanely comfortable sofa and chair that will last us a long time. 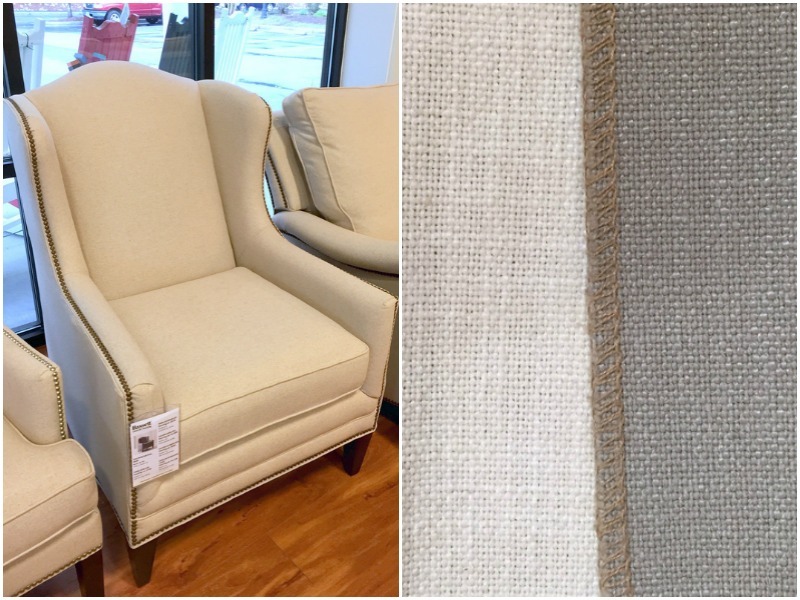 We went with Bassett Furniture for both the sofa and chair and I think we had all of our options and colors picked out within 30 minutes. It took us ten seconds after sitting on that sofa to decide this was definitely the one. The downside is we still have a few weeks before its delivered so our current living room looks ugly. We're also planning to make a Restoration Hardware knockoff coffee table like this one. It may be a few weeks until we have time to build it but I'm so excited! Rugs. Ugh...The great rug debate. I swear this has been one of the hardest things to pick out because its impossible to find any in person so you're stuck hoping you'll like the real life colors of one you buy online. We've bought two different rugs and both have had really yellowish-ivory designs despite looking white online so back they went. Moroccan Shag Rug. Trellis Rug. 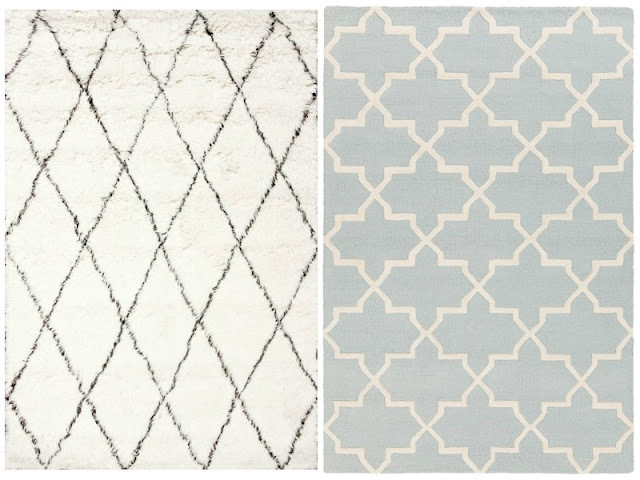 I hate to jump on the Moroccan shag rug bandwagon but I do really like it and it would go well with our colors. I'm just worried about shedding and the color being more ivory than white. Also who wants to pick up tumbleweeds of rug fuzz while also cleaning up after a baby, dog, and husband? My other option is to find another rug in a shade of light blue and hope the pattern is actually white. Spare Bedroom. We moved the dresser from Rowan's nursery to the spare bedroom because it just wasn't easy enough to open the drawers with one hand while wrangling the kid/keeping him from rolling over with the other. I love it in this room, especially with our new bed frame. We grabbed some Ikea nightstands and a lamp out of storage, but this room desperately needs some color! The walls will eventually be painted and the bedding needs some life. What do y'all think?! What are some of your favorite places for cheap home decor? I'm loving H&M Home right now! I love everything you have picked out so far! We moved into our first home this past October, and we are still trying to decorate it! It is so expensive, and I just keep telling myself that it will just take time! I love Ballard, Wayfair, One Kings Lane and Joss & Main! Love the sofa and chairs you got!! Quality furniture is the way to go to go, you won't regret it in the long run. That couch looks incredibly comfy! And love the light fixture! I almost bought that white and black rug until I thought about how dirty it would probably get. Then I ended up getting a gray an white one and it definitely gets dirty so I'm glad I steered away from white! love what you have going on thus far! it seems so classic! Our sofa is also from Bassett and we have been really happy thus far! I love this post and I love your choices so far! Everything looks so comfy and stylish. We got a shag rug when we first bought our house and we ended up rolling it up and sticking it in storage after a few months. The vacuum didn't do a good job of picking things up from the long fibers, it permanently smelled, and was flattened in the high-use areas. It just wasn't a good decision for us. I have that Moroccan Shag rug (but from Overstock) and it does not shed at all. It's made out of sisal and we really like it, it's definitely white but turns ivory pretty quick if you're in a high traffic room. We have it in P's nursery which also happens to be Finn's favorite spot to lay. LOVE that Bassett couch!! our bed is from Bassett and I love it! Also love those rugs!